In the previous pAsuram, mAmunigaL mentioned about doing all kinds of kainkaryam to devotees. While using the word “irAmAnusAya nama:”, he got reminded of who gave him this mind of doing kainkaryam. 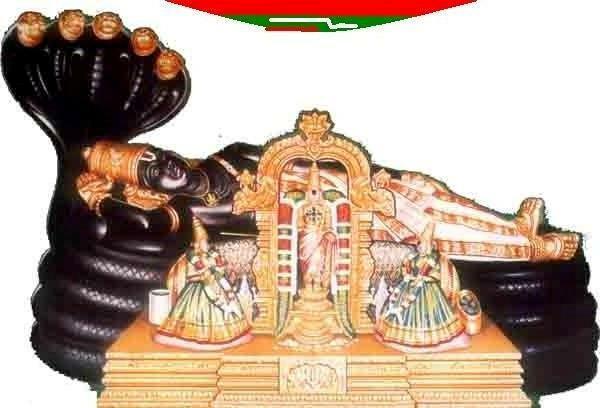 In this pAsuram, he explains that it was periya perumAL who blessed his senses and organs to do kainkaryam for SrI rAmAnuja and his devotees. He says this very gleefully. naNNAdhavarai arangEsar seydha nalam namakkE!!! eNNAdhu – think about them. isaiyAdhu – will not be about them , be it talk / praise. irainjAdhu – will not bow down (towards them). onRum kANaluRA – will not see anything (related to them). arangEsar – It was periya perumAL who gave me the thoughts and the senses associated with it. (kaliyAr naliya oNNAdha vaNNam ulagaLiththAn yathirAsAn – This phrase could also mean “SrI rAmAnuja who protected the world from the brunt of the cruel kali). mAmunigaL says that his mind, eyes, mouth and head will never do what they are supposed to do, when it comes to facing the people who do not surrender to the lotus feet of SrI rAmAnuja. He says that his eyes will not see them, his head will not bow down, his mind will not think and his mouth will not talk about them. He celebrates that this blessed opportunity was bestowed upon him by the infinite mercy of periya perumAL SrIrangarAjan. This entry was posted in Arththi prabandham, Other and tagged arththi prabandham, mamunigal, ramanuja on March 15, 2017 by santhanam rajagopalan.